Amla pickle or gooseberry pickle is a favorite of many. As amla or gooseberries are not available throughout the year, you have to make the pickle when they are available. Amla / gooseberry is is known as amalaki, avla or awala (Hindi / Marathi), nellikai (Kannada). Amla or gooseberry pickle takes about a week to get ready to eat. You may start to use it after one day if you do like the spice and sour taste and the not so soft feel of amla. It has a wonderful taste of it's own. Anyways, amla is also eaten by itself. Many enjoy it's sour taste. Did you know, if you take a sip of water after eating amla, water tastes very sweet. You may start using amla pickle after 1-2 days if you like the taste. 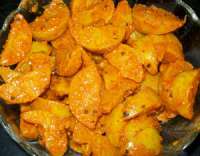 There are a few recipes for amla achar. This recipe is the simplest and easiest. I will add other recipes later. Large Amla or gooseberries - 10 No. When they stop spluttering, add turmeric powder, asafoetid. Fry for a few seconds. Mix together Amla or gooseberry pieces, salt, red chili powder, fenugreek, turmeric and asafetida. The gooseberries will release some juice slowly. Stir the bottled amla mixture everyday with a dry spoon once per day for about 6-7 days or longer. Add the remaining ingredients and the tempering.